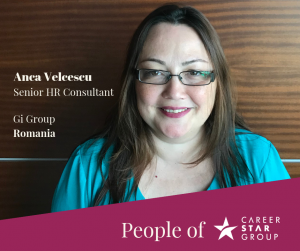 Anca is the Senior HR Consultant for Gi Group Romania. For the past 9 years, she has presented services for companies according to HR solution. Her human resources experience includes helping executives in career transition, corporate search & selection, leasing office space, temporary placement, and finding permanent placement. She has worked with individuals and companies from a number of industries including Engineering, Automotive, Training, Law, Industrial Manufacturing, Retail, Sales and Marketing, FMCG, Pharmaceutics, as well as Banking, Finance and Accounting, Administrative, and Logistics. As a recruitment consultant she has found positions such as Project Director, Legal Director, Marketing Director, Sales Director, Auditor / Chief Financial Officer, Sales and Logistics Director for Financial / Controller Analysts. She is passionate about helping professionals land their next roles, as well as providing the right fit for a company’s culture.